1538 - Spanish conquer Bolivia, which becomes part of the Vice-royalty of Peru. 1545 - Silver Mountain, or Cerro Rico, discovered at Potosi in the southwest, providing Spain with immense wealth. 1824 - Venezuelan freedom fighter Simon Bolivar, after whom Bolivia is named, liberates the country from Spanish rule. 1825 - Bolivia becomes independent with Simon Bolivar as its president. 1836-39 - Bolivia enters into a federation with Peru, but the federation fails following Peru's defeat in war with Chile. 1879-84 - Bolivia becomes landlocked after losing mineral-rich, coastal territory in the Atacama to Chile. 1903 - Bolivia loses the rubber-rich province of Acre to Brazil. 1920 - Rebellion by indigenous peoples. 1923 - Revolt by miners is violently suppressed. 1932-35 - Bolivia loses territory to Paraguay after it is defeated in the Chaco War. 1952 - Peasants and miners overthrow military regime; Victor Paz Estenssoro returns from exile to become president and introduces social and economic reforms, including universal suffrage, nationalisation of tin mines and land redistribution, and improves education and the status of indigenous peoples. 1964 - Vice-President Rene Barrientos stages military coup. 1967 - US helps suppress peasant uprising led by Ernesto "Che" Guevara, who is killed after being betrayed by peasants. 1969 - Vice-President Siles Salinas replaces Barrientos who is killed in plane crash, but Salinas is himself deposed by the army, which rules with increased severity. 1971 - Col Hugo Banzer Suarez comes to power after staging military coup. 1974 - Banzer postpones elections and bans political and trade union activity in the wake of an attempted coup. 1980 - General Luis Garcia stages coup after inconclusive elections; US and European countries suspend aid in view of allegations of corruption and drug trafficking. 1981 - General Celso Torrelio Villa replaces Garcia, who is forced to resign. 1982 - Torrelio resigns as the economy worsens; military junta hands over power to civilian administration led by Siles Zuazo, who heads a leftist government. 1983 - US and European countries resume aid following the introduction of austerity measures. 1985 - Siles resigns in the wake of a general strike and an attempted coup; elections held but are inconclusive; parliament chooses Paz Estenssoro as president. 1986 - Twenty-one thousand miners lose their jobs following the collapse of the tin market. 1989 - Leftist Jaime Paz Zamora becomes president and enters power-sharing pact with former dictator Hugo Banzer. 1990 - Some 4 million acres of rainforest allocated to indigenous peoples. 1993 - Banzer withdraws from the presidential race, which is won by Gonzalo Sanchez de Lozada. 1997 - Banzer elected president. 1998 - Banzer tells the United Nations that he is committed to freeing Bolivia from drugs before the end of his term in 2002. 1999 - Encouraged by moves to prosecute former Chilean dictator Augusto Pinochet, opposition demands inquiry into Banzer's role during the repression of the 1970s. 2000 - Banzer announces the almost total eradication of the coca plant in the Chapare jungle region. 2001 January - Government declares almost half of Bolivia a natural disaster area following heavy rains. 2001 8 August - Vice-President Jorge Quiroga sworn in as president, replacing Hugo Banzer who is suffering from cancer. He dies in May 2002. 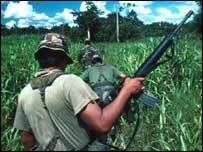 2001 December - Farmers reject a government offer of $900 each a year in exchange for the eradication of the coca crop used to produce cocaine. 2002 August - Gonzalo Sanchez de Lozada wins a clear victory in a National Congress run-off vote and becomes president for a second time. His rival, coca growers' representative Evo Morales, leads a strengthened opposition. 2003 February - More than 30 killed in violent protests against proposed income tax. President Sanchez de Lozada withdraws the proposal. 2003 September-October - 80 killed, hundreds injured in protests fuelled by government plans to export natural gas via Chile. President Sanchez de Lozada resigns under pressure of protests and is succeeded by Carlos Mesa. 2004 April - President Mesa signs natural gas export deal with Argentina. Opponents say deal pre-empts referendum on gas exports planned for July. Protesters take to streets, demand president's resignation. 2004 July - Referendum on gas exports: Voters back greater state involvement in the industry and approve exports of the resource. 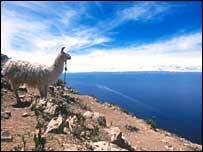 2004 August - Landmark deal signed to allow Bolivia to export gas via a Peruvian port. 2005 January - Rising fuel prices trigger large-scale anti-government protests and blockades in Santa Cruz, the country's largest and wealthiest city, and in El Alto, near La Paz. 2005 March - President Mesa submits his resignation, blaming protests which he says have made it impossible to govern. Congress rejects the offer, as well as a later request by the president for early elections, and Mr Mesa remains in office. 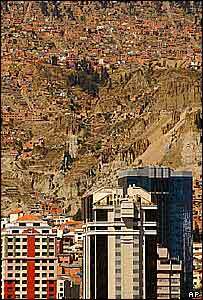 2005 May - Protests over energy resources bring La Paz, and government business, to a near standstill. President Mesa promises a rewritten constitution and a referendum on autonomy demands from resource-rich provinces. 2005 June - As angry street protests continue, President Mesa resigns. Supreme Court head Eduardo Rodriguez is sworn in as caretaker president. 2005 December - Socialist leader Evo Morales wins presidential elections. 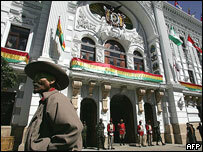 He becomes the first indigenous Bolivian to take office. 2006 May - President Morales issues a decree to put the energy industry under state control. 2006 June - President Morales claims victory in elections for a new assembly which will write a new constitution, aimed at giving more power to the indigenous majority. 2006 October - Clashes between rival groups of tin miners leave 16 people dead in the town of Huanuni. 2006 November - Land reform bill is narrowly approved by the Senate. The bill aims to expropriate up to one fifth of Bolivian land for redistribution to the landless poor. 2006 December - Bolivia completes its gas nationalisation programme, launched in May, giving the state control over the operations of foreign energy firms in the country. 2007 January - Pro-Morales trade unionists and coca growers set up a parallel local government in Cochabamba and demand the resignation of the state's pro-autonomy governor. Clashes leave two people dead. 2007 May - President Morales spearheads a protest campaign after world football's governing body, Fifa, bans international games at high altitudes. The ban rules out international matches in cities such as La Paz and Potosi. 2007 August - Presidents of Bolivia, Venezuela and Argentina sign joint energy deals worth more than $1bn. 2007 December - President Morales formally receives controversial new draft constitution which he says will promote re-distribution of the country's wealth and give a greater voice to the indigenous majority. 2008 August - President Morales gains 67% of vote in recall referendum on his leadership. 2008 September - Anti-government protests escalate into violence in the east and north of Bolivia, with 30 people killed in the worst-affected region, the northern province of Pando. The government and opposition agree to talks in an effort to resolve the crisis. 2008 November - Bolivia stops US drug enforcement agency from operating in the country. 2009 January - New constitution giving greater rights to indigenous majority is approved in a national referendum, with more than 60% voting in favour. 2009 April - President Morales says a plot to assassinate him was foiled when police killed three international mercenaries in a raid on a house in the opposition stronghold Santa Cruz. 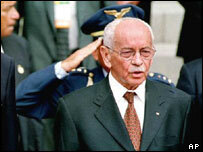 2009 May - Ex-President Gonzalo Sanchez de Lozada is tried in absentia over death of 60 during protests in 2003. 2009 December - President Morales is re-elected for a second term with more than 60% of the vote. 2010 May - President Morales orders nationalisation of four electricity firms, saying the state now controlled 80% of country's power generation. 2010 October - Government scraps new law designed to cut cocaine production in response to anger from coca growers. 2010 December - Thousands of Bolivians take to the streets to protest government plans to increase the cost of fuel. 2011 January - Government drops plans to raise fuel prices by more than 70%. 2011 February - Sharp rises in the prices of basic foodstuffs and food shortages spark violent demonstrations. 2011 August-September - Plans to build a major road through a rainforest reserve - a project the government says is essential for development - spark mass protests. 2011 October - More than 60% voters cast invalid ballots in election to choose Bolivia's top judges, in what is interpreted as a major slap in the face for President Morales. 2012 January - Bolivia temporarily leaves UN Conventions on Narcotics in protest against classification of coca as an illegal drug, signs agreement with US and Brazil to help reduce the production of illegal cocaine. 2012 April - President Morales rescinds the contract awarded to Brazil's OAS to build a controversial road through the Amazon forest. 2012 May - President Morales nationalises Spanish-owned electric power company REE, saying it has not invested enough in Bolivia. 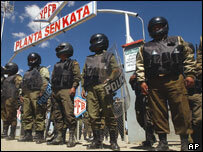 2012 June Police strike for better pay sees violent clashes across country. Government accuses strikers of setting stage for coup, an allegation denied by police officers. Settled at end of month with reported 20% rise in wages.